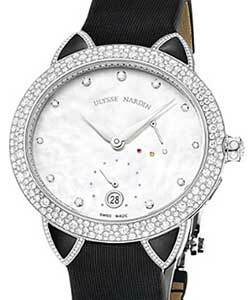 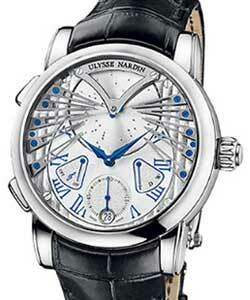 Ulysse Nardin established his company in 1846. 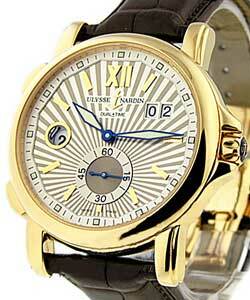 30 years later, his son, Paul-David, took over and continued his fathers excellence. 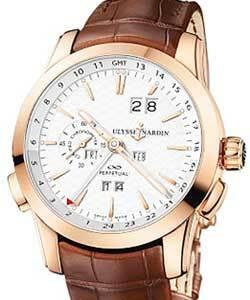 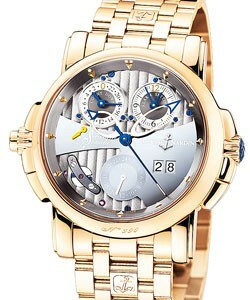 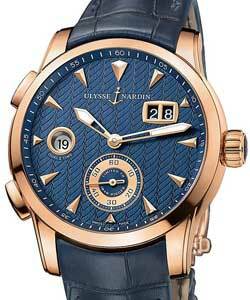 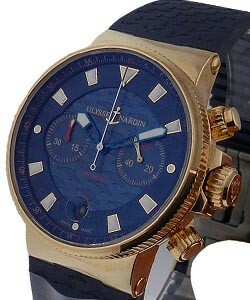 Ulysse Nardin specialized in mechanical marine chronometers. 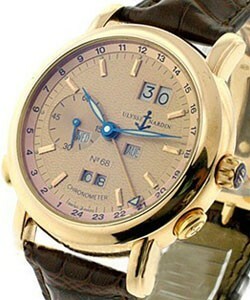 For the next 50 years, they won so many awards and certificates, the company's legacy was guaranteed. 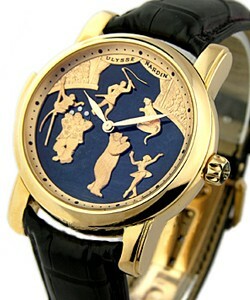 The company was sold in 1983. 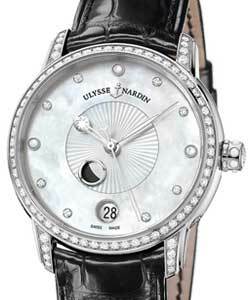 In 1996, the company celebrated its 150th anniversary with the release of the 1846 Chronometer. 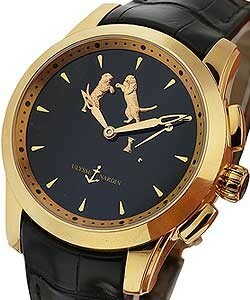 Many other incredible watches soon came including the 'Freak' and the 'Sonata'. 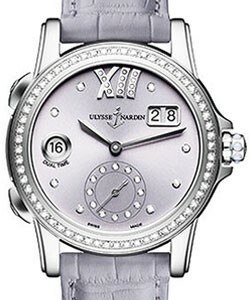 Historically, Ulysse Nardin was best known for being a manufacturer of marine chronometers, but today Ulysse Nardin produces numerous fashionable and complicated watches. 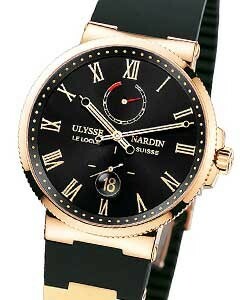 'Dual Time collection' represents two major Ulysse Nardin qualities; confident, exotic stylishness in everything concerning the visual appearance (dial composition and decoration, case design, large, legible indexes), and mechanical complication, namely the titular home time display. 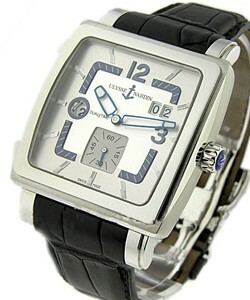 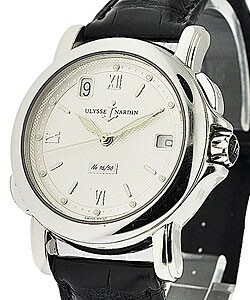 Ulysse Nardin 'Dual Time' watches come in classic round or rectangular (the 'Quadrato' line) shape. 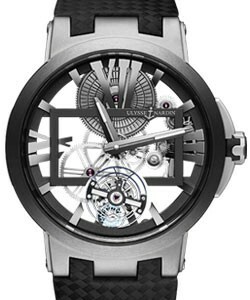 'Michelangelo' watches - including chronometers and chronographs - feature tonneau shaped cases with a twist: the horizontal sides of the case continue slightly to form scroll-like lugs. 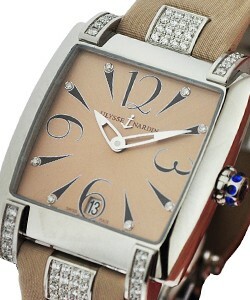 This design is enhanced even more by its pairing with oversized Roman and Arabic numerals. 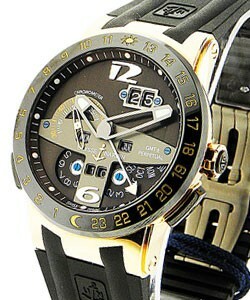 Complications include dual time, big date, perpetual calendar ('Perpetual Ludovico' line), and the previously mentioned chronograph. 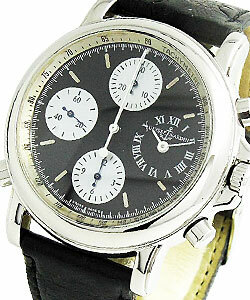 'Michelangelo', 'Michelangelo Big Date', 'Michelangelo Chronograph', the XL 38x 43mm 'Michelangelo Gigante', 'Michelangelo Gigante UTC', 'Michelangelo UTC'. 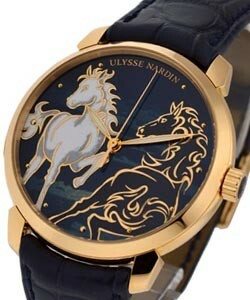 Ulysse Nardin's 'Michelangelo Gigante', is the largest watch in this collection. 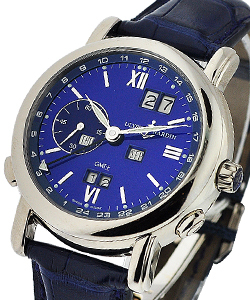 Measuring 38 x 43 mm, it is definitely a head turner. 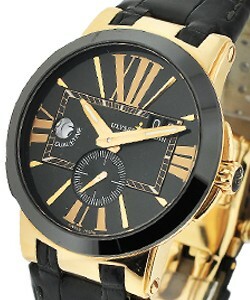 The 'Dual Time' version has the crown set at three o'clock, a date window at two o'clock, and the second time zone at nine o'clock. 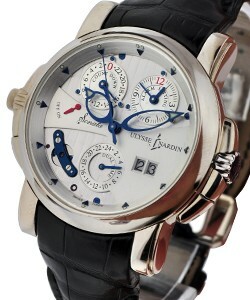 One adjusts the second time zone with the two pushers on the left side of the case. 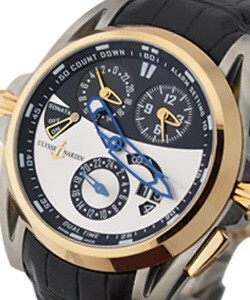 Both versions have 42 hour power reserve and are water resistant to 50 meters. 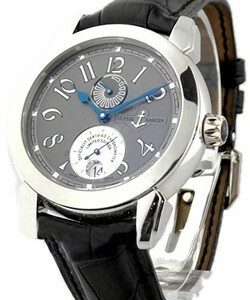 While all Ulysse Nardin 'Michelangelo Gigante' watches have Roman numeral markers, the 'Gigante' line is avail in several case and dial color combinations. 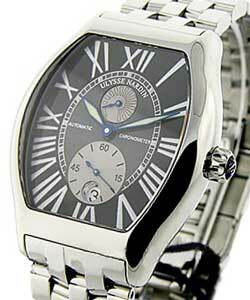 The smaller 'Michelangelo' measures in at 35.1 x 37.1 mm. 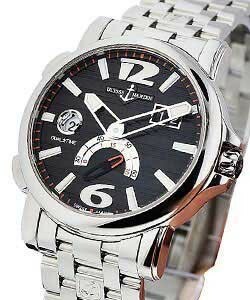 This mid-sized version, like the larger 'Michelangelo Gigante', is available in a big date, dual time and chronograph version, but comparably smaller 'Michelangelo' watches are avail with both roman and Arabic hour markers. 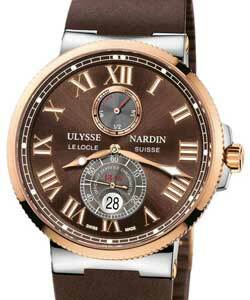 Should you be seeking a more complicated tonneau cased Ulysse Nardin luxury watch, take a look at the 'Ulysse Nardin Perpetual Ludovico'. 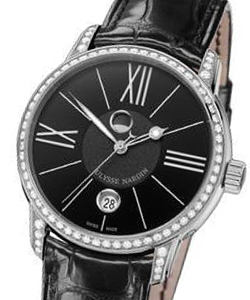 Set in the larger case and only avail in 18K white or yellow gold, this perpetual calendar watch allows the tracking of day, date and month. 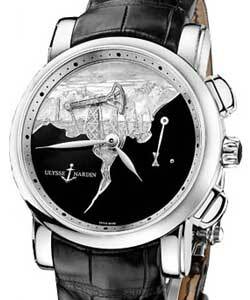 The most popular and familiar of all Ulysse Nardin watch lines is the 'Ulysse Nardin Marine Collection', among the most reliable ever made; Ulysse Nardin's 'Marine Chronometers' are still sought by collectors around the world. 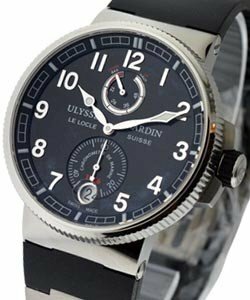 Originally released back in 1846, Ulysse Nardin has kept updating these watches so that they are not just the most reliable chronometers avail, but also as modern and aesthetically pleasing as more recently released marine watches. 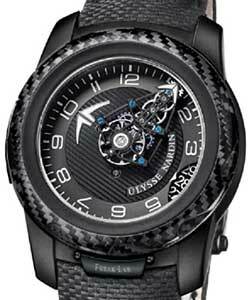 Case and point; just last year, Ulysse Nardin unveiled the very modern and ultra-hip 'Monaco 2010 Marine Diver Limited Edition' at the 2010 Monaco Yacht Show. 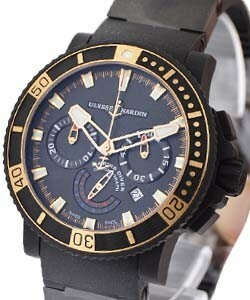 All black, with cobalt blue markers and hands, the watch, their latest 'Marine Diver' watch definitely affirmed that Ulysse Nardin is still indeed the king of the Oceans. 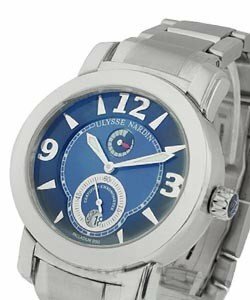 Ulysse Nardin Marine models include 'Maxi Marine Chronometer', 'Marine Chronometer', and 'Maxi Marine Diver', all offering a range of water related functions: luminous hands, water resistance, screw down crowns, and more. 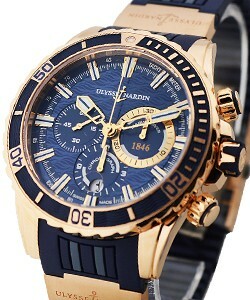 'Marine Annual Chronograph', 'Marine Chronograph', 'Marine Chronometer 1846 Marine Diver Chronometer', 'Marine Perpetual', 'Maxi Marine Chronograph', 'Maxi Marine Chronometer', 'Maxi Marine Diver', 'Maxi Marine Diver 45mm', 'Maxi Marine Diver Chronograph' and the 'Maxi Marine Diver Chronometer'.